Soiree Games (or 'we') undertakes to collect Your Data by means that are fair, legal, and transparent. If you visit our web-site, your web-browser automatically discloses, and our web-server automatically logs the following information: the date and time, the IP address from which you issued the request, the type of browser and operating system you are using, the URL of any page that referred you to the page, the URL you requested, and whether your request was successful. This data may or may not be sufficient to identify you. Soiree Games undertakes to store Your Data in a manner that ensures security against unauthorised access, alteration or deletion, at a level commensurate with its sensitivity. We undertake to store Your Data only in jurisdictions where data protections are at least equivalent to those required under the OECD Guidelines. We also undertake to use Your Data only if it has demonstrable relevance to the particular use to which it is being put. Your Data will be utilized in such a manner as to take into account the possibility that it is not of sufficient quality for the purpose, e.g. because it is inaccurate, out-of-date, incomplete, or out-of-context. 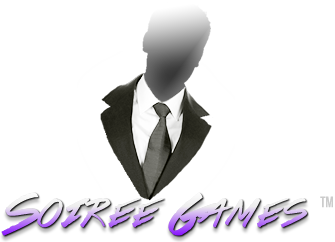 We undertake to provide one or more channels for communications to Soiree Games, which are convenient to users, to promptly provide a response to the communication, in an appropriate and meaningful manner. The content of the pages of this website (www.soiree.info) is for your general information and use only. It is subject to change without notice. Neither we nor any third parties provide any warraty or guarantee as to the accuracy, timeliness, performance, completeness or suitability of the information and materials found or offered on this website for any particular purpose. This website contains material which is owned by us, except where noted. This material includes, but is not limited to, the design, layout, look, appearance and graphics.